“You want to see our sensor?” Pierre Forcioli-Conti gestures at a high window that leads to the roof. “You’ll have to climb over Matt’s desk and go out the window.” No problem. I wriggle through the window and climb out on top of the the refurbished 1940s cinema on Mission Street in San Francisco. It doubles as his office. Pierre joins me next to the cinema's still-intact marquee, once topped by a neon-lit sign that used to read GRAND. We duck under the struts holding up the marquee, then crunch over tar paper and decades of bird droppings to reach a balustrade ringing the roof. We’re clinging to the outside of the new digs of Gray Area, an art and technology non-profit. 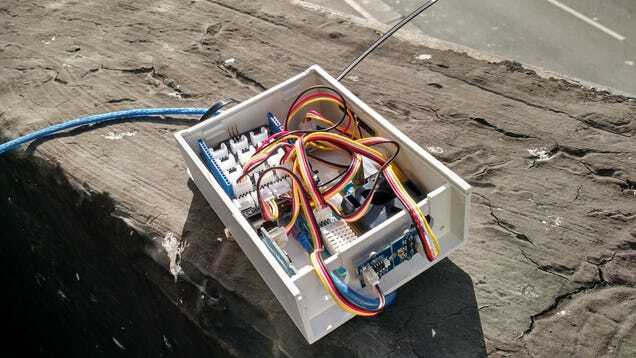 One of the many projects they’re supporting involves putting sensors on city buildings. Pierre, director of programmes and initiatives at Gray Area, reaches over the edge of the roof and retrieves a white plastic case about the size of a pencil box. He cracks it open for me, revealing a micro-controller and a few sensors inside for tracking pollution, dust, light, sound, temperature, and humidity. The device was made by Seeed Studio for a guerrilla data-gathering project called Sense Your City. Working with urban media non-profit Data Canvas, volunteers have put 100 of the sensors on the outsides of buildings throughout San Francisco — and in seven other cities around the world, including Bangalore, Singapore, and Geneva. Pierre, who began his career as a film-maker, describes the sensors the way a director might describe cameras. They “allow you to see things from a different angle.” He says they’re for helping people to tell stories. And of course these sensors pick up bits of information that cameras and microphones never could: they smell the air, they taste moisture, and they feel the sting of pollution. Though a camera can give you a general sense of how a place looks, these sensors can tell you very precisely about all the complex networks — from weather to social groups — that make a place what it is. The group just posted the winners from their first data visualisation contest, using information gathered during December 2014 and January 2015. There were a wide range of entries that used different parts of the data to show relationships between the cities, as well as drilling down on each city alone. Some are artistic — a project called Sonic Particles assigns different musical tones to different pieces of data, turning the whole dataset into haunting electronic music. Others are more practical, such as a project called Seeing the Air, which offers intriguing visualisations of air quality in all the cities. In this video, below, of a visualisation created by Jonas Lauener and Matthias Berger from the Future Cities Lab in Singapore, you can also see how these sensors might help scientists understand how temperature and humidity in cities create clouds. Lauener and Berger streamed data from their sensor to a video file of a weather timelapse video in Singapore. The result was a visual record of the clouds (in the photos) and the exact temperature and humidity (from the sensor). 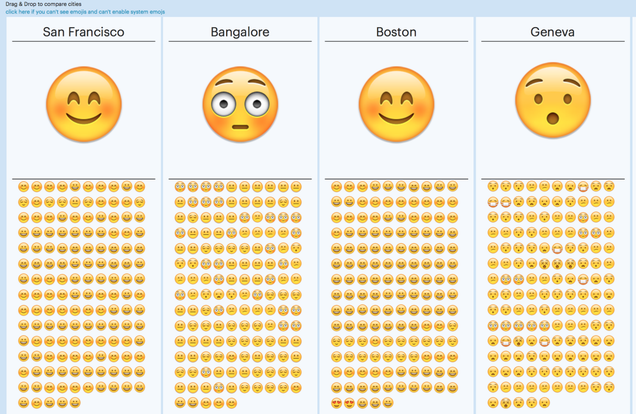 And there are data visualisations that are deceptively silly, like this one by Michael Flückiger which converts air quality — measured in pollution and dust levels — into emoji. So all seven cities get a daily emoji rating, which sounds cute until you realise that what you’re looking at is whether or not people can breathe in these environments. If you’d like to be part of Sense Your City’s ongoing experiments, they will be deploying more sensors and making all data available for future contests and projects. Join up, and discover all the stories in your city’s millions of data points.